Upon learning that a race of aliens called the Shayol are heading for Earth, Green Lantern thinks back to five years prior, when three of his fellow Corpsmen were killed by them. It is with a grim heart that GL informs his Justice League teammates of the aliens' arrival, at once prepared to lose more of his associates to the bloodthirsty Shayol. As soon as the aliens arrive, the first thing they do is unleash an electromagnetic pulse on the Earth that disrupts power systems across the western hemisphere. Superman, Hawkgirl, and Wonder Woman move for the ship, tackling robotic sentries in their paths while Green Lantern and J'onn J'onnz work on contacting the alien race and learning of their intentions. Before long, J'onn is able to reach inside the aliens' minds and understand that they are visiting Earth in peace. GL soon learns that the military caste of Shayol ruled years ago but was eventually defeated and stripped of their power by the rest of the Shayol. The aliens are now searching the galaxy in peace, hoping to make amends for the evil of the previous leadership. The Justice League eventually learns to forgive, and John Stewart welcomes one of the Shayol into the Green Lantern Corps. Story - 2: Does this premise seem at all familiar? The mystery alien race that shows up and no one's sure whether they're good or bad for 22 pages? It should, because these stories have been recycled over and over again throughout the course of this title. Don't believe me? Look at last issue! And not too long before that, JL Adv. #18! As for this story itself, and its merits, there aren't many. It's a predictable, dull plot with little or no trace of suspense, character development, or personality. Aside from Hawkgirl, who has an extreme case of PMS, each and every character acts exactly the same. Art - 2: Delaney's work on this issue is even stiffer and more uninspired than his last few appearances on this title. I've seen good Delaney work, and this isn't it! 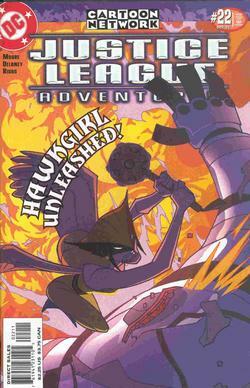 Cover Art - 2: The cover has just about nothing to do with the issue, since the focus is supposed to be on GL, and Hawkgirl's mouth looks as if it's dripping off her chin. Also, what's with that terrible Cartoon Network banner on the top?